The book walks you through a transformation of life purpose, health and wellness, and a fulfilled life of abundance! Author, life coach, and speaker Niccie Kliegl reveals a proven plan for navigating through life with success by partnering with God every step of the way. 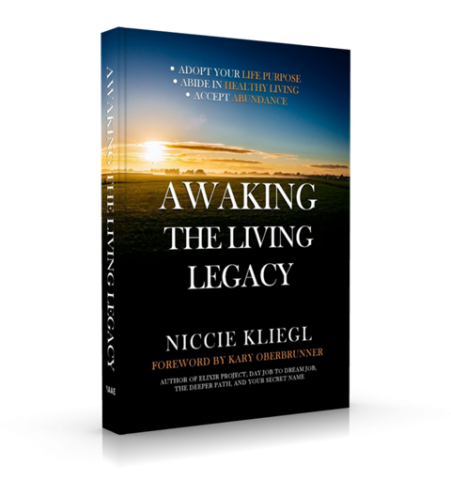 In this book you will discover: Awaking the Living Legacy truly depicts Niccie’s heartfelt desire to teach others of the amazing strength, healing, peace, and abundance that waits at the door of those who partner with God. With twenty years of leadership in the healthcare industry and countless sessions of planning and goal setting, Niccie passionately assists her clients to function at their highest place in life. She founded Fulfill Your Legacy, LLC, in 2015 with her mission of infusing faith and the word back into the daily lives of those she comes in contact with. She is a mother of two beautiful daughters and a wife to her loving husband of twenty-five years, Jeff Kliegl. Click here to get a sneak peek at how the program works and to see a breakdown of pricing and payment plans! LEARN ABOUT THE LEGACY ACADEMY!